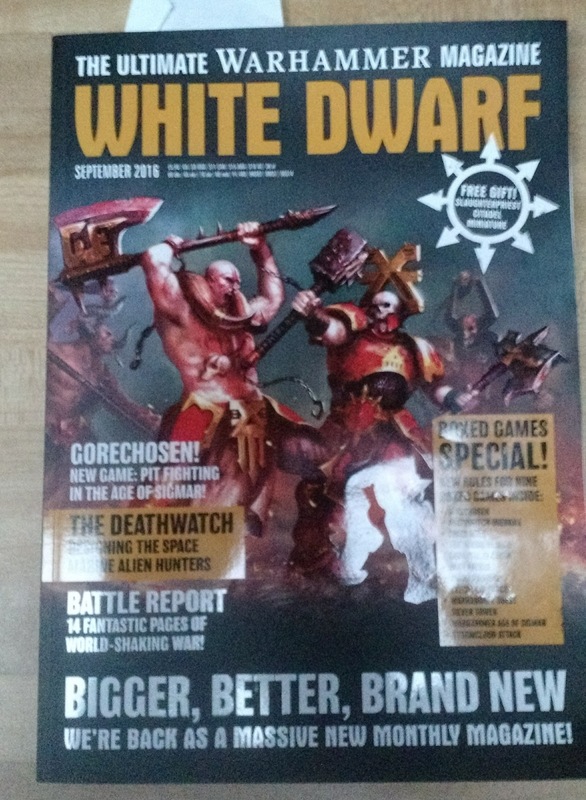 Like many in the blogging world I picked up a copy of the "new" White Dwarf Monthly Magazine. This issue was released on September 2, 2016, and since I was out of town (playing Risk legacy), I picked it up the following Monday from my FLGS. Many of you have no doubt read all you need to about the magazine by now (or have a copy), but if not, read on. As the bottom of the magazine states, it is in fact "Bigger, Better, Brand New"... well, at least the first two. The magazine is fairly long, even by the standards of prior monthly White Dwarfs, and certainly in comparison to the weekly issues. The paper quality is very high, and as you can see from the picture above, it retains the weekly White Dwarf gloss/matte printing for the cover, which can really enhance the picture. Photography is likewise excellent, with none of the muddy backgrounds that sometimes were an issue at the end of the prior monthly era. 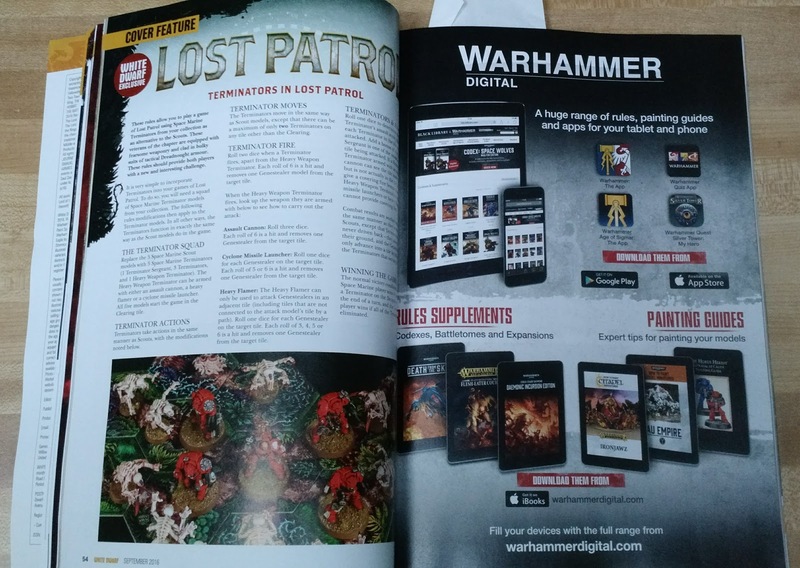 You will also note that "Games Workshop" does not appear at the top, but rather "Warhmmer", in keeping with recent branding efforts I think. This particular issue has a very large section on adding rules to the boxed games released in the last few years (including Space Hulk 2009/2014). As I have none of the boxed games mentioned, this was interesting but of little use; however I am sure that it would be very interesting to anyone who had one or more of those. One of the unfortunate aspects of the magazine returning to a monthly format is that advertisements returned as well. As you can see in the picture above the right page is an advertisement for various Warhammer digital products. To be fair, you could call most of the magazine an "advertisement", but new product announcements and the like have at least some use (and more so now that they are more "secret" until the magazine is released.) By my rough count there are 12 pages in this magazine that are solely advertisements for existing products, and therefore have little added value. Certainly not much compared to a non-hobby magazine, but still a bit annoying. Another feature that I missed was the lack of new rules. With the weekly format, miniatures often released before the codex/rulebook to which they belonged, and White Dwarf would fill the gap with the necessary rules. 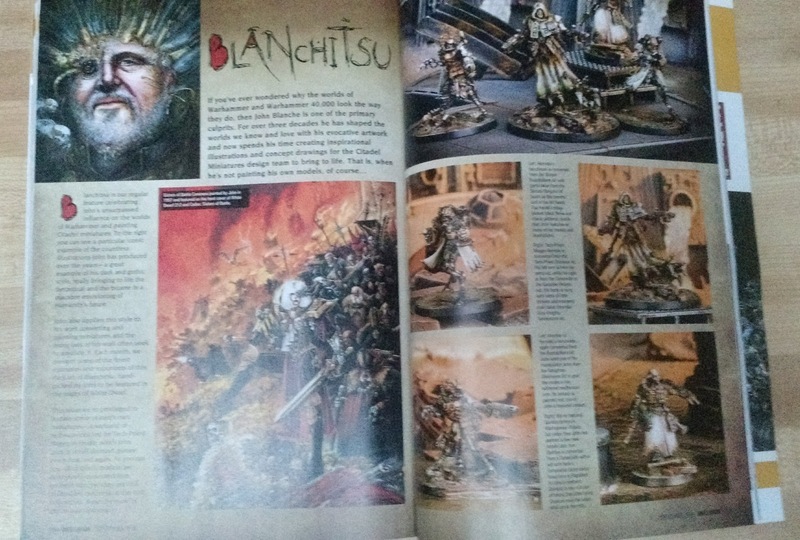 I really enjoyed this feature, as I am unlikely to buy any new codexes, but may buy some of the miniatures for other purposes and games (mostly older GW games anyway). Hopefully this feature comes back (for the rumored Genestealers?) in future issues. One of the most exciting features, to me anyway, is that Blanchistu returns to White Dwarf! In the era of the weekly White Dwarf, this "article" series was relegated to Visions instead, so seeing it return to an accessible location is quite nice. I am certainly looking forward to seeing some of the figures from various games and blogs in high resolution photography soon. Anyway, enjoying the magazine very much, and unlike the last few monthly magazines (to say nothing of the weekly pamphlets), I am still reading it. I expect to pick up the next few from my local store, and if things keep up at this level, I will resubscribe for the first time in quite a few years now. 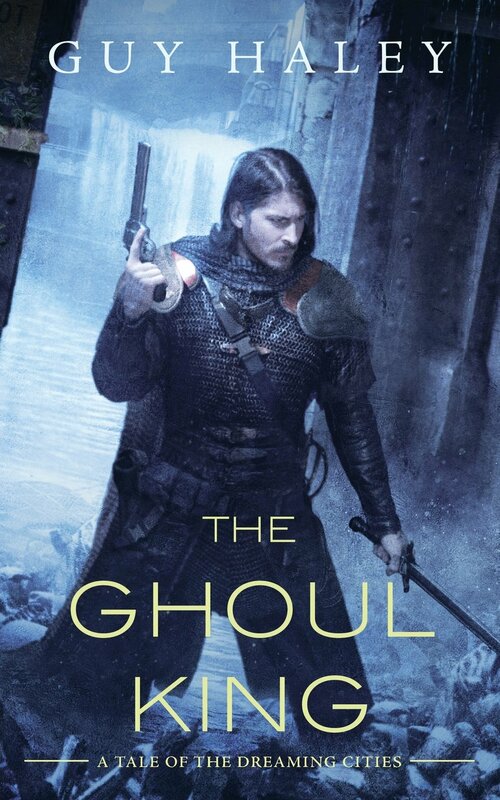 Last week I finished reading Star Wars: Bloodline, and was finally able to move on to the second book of the Dreaming Cities, The Ghoul King, by Guy Haley. I read the first book at the beginning of August, and quite liked it. Like the proceeding book, this was more of a novella, but this time it felt like the story was more complete in the pages presented. Following directly on from the prior book, the knight Quinn is dragooned into exploring the ruins of the Dreaming City of Columbus Ohio, which was nuked by the other Angels roughly 20 years prior. In this story we learn a bit more about how much Quinn differs from the baseline of humanity, and to what lengths the Angels will go to prevent the spread of forbidden knowledge. As with the first book I really enjoyed the setting, and would like to read more about it. I did not have quite as much of a "ooh, D&D" response to this one, and instead was thinking about how to game ghouls vs. plucky lower tech survivors (possibly played by cowboy types). I expect that most of the post apocalyptic miniatures games could easily handle a couple of scenarios about having to guard horses, or withstand waves of ghouls departing the city like bats at sunset. This past weekend, I visited my wife's cousins and as is customary after the children were abed, we broke out some board games. 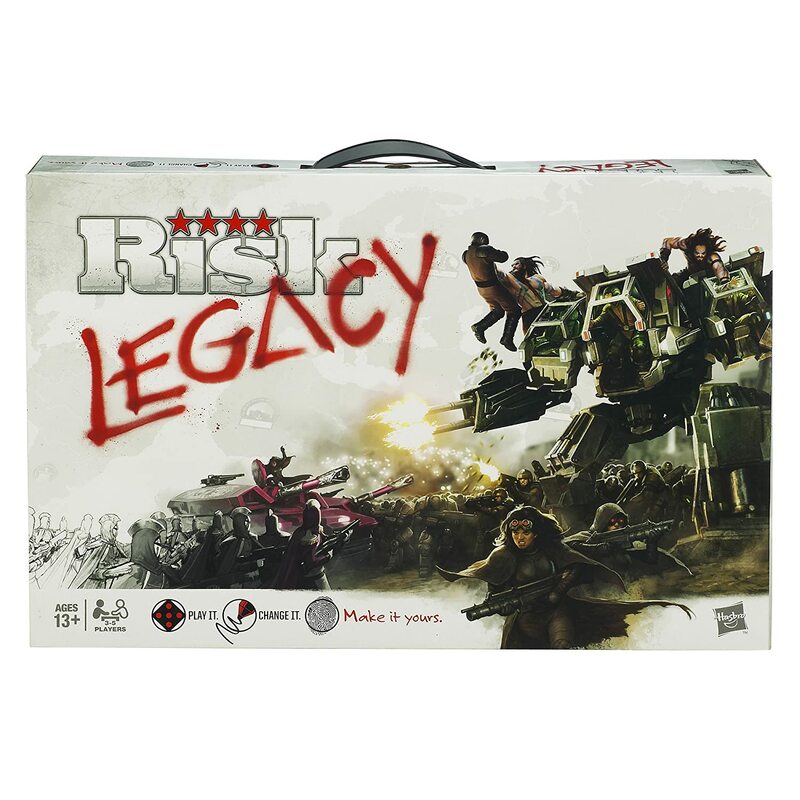 This time we got out Risk Legacy , a version of the classic game where you change the board as you play. 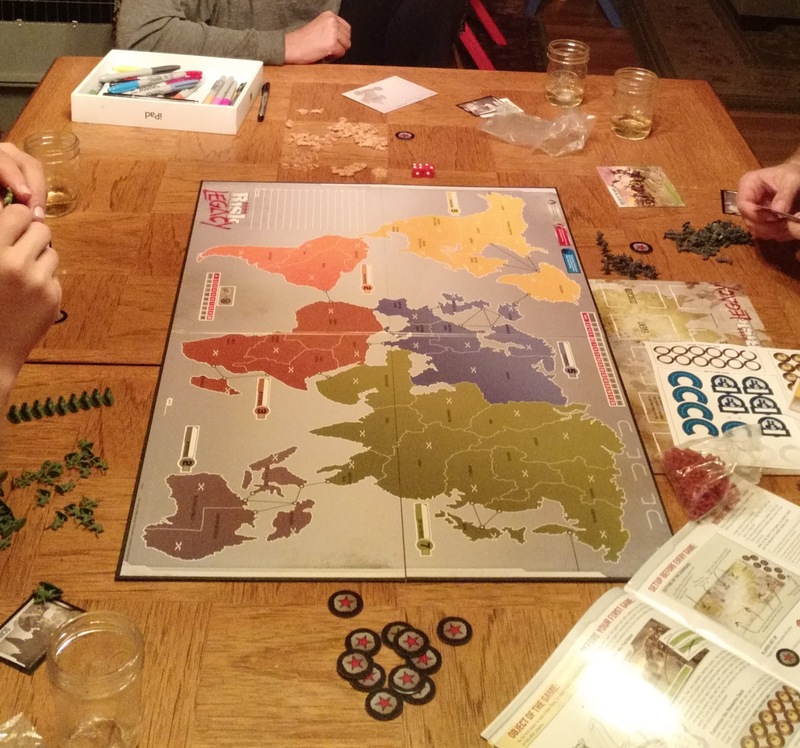 Released in 2011, the game is best thought of as a "Risk overlay", that is it starts as a slightly quicker version of Risk played as a campaign. Players select a faction, and a starting position, and then expand to rule the world (through collection of star tokens/bases). Then you start "scaring" the board with stickers which change the value of territories, making them harder to defend, or easier. Then after someone wins, they sign the board, and gets to add a major city to the board, or rename a continent, or add some other change. 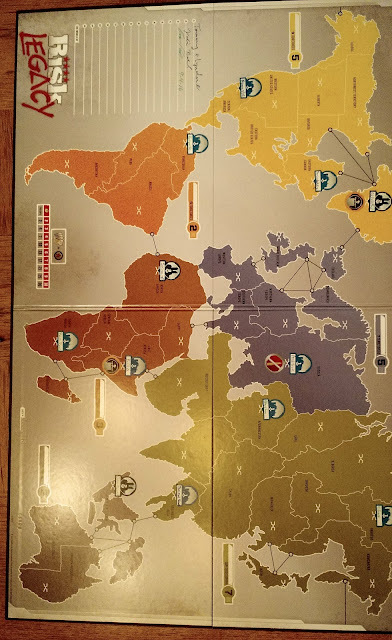 Those that did not win the game, but were not eliminated also get to change the board, so that after a few games, the board is heavily marked up, with cities spread out all over. Cards get marked up and destroyed. Risk was never "my" game, and yet this variant is the game I most want to play next, and we are already talking about buying Pandemic Legacy when we "Finish" this one. Last night I finished reading The Song of Achilles, by Madeline Miller. 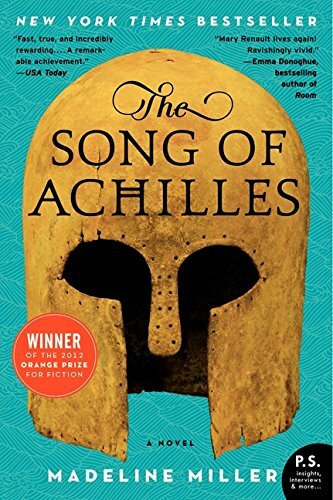 A fairly good retelling of the Patroclus/Achilles relationship, and how their lives intersect with the Trojan war (mostly as told by the Iliad). The story is told from the point of view of Patroclus, and starts from before his meeting with Helen and ends somewhat after the death of Achilles. I particularly liked how Odysseus is characterized, and how the gods are more like creepy alien beings with alien goals, rather than glowing heroic humans. Now of course what a book like this is really good at is making one want to wargame the conflicts in it... which in this case means the siege of Troy, particularly the "heroic" actions relating to that. It seems like a larger skirmish game would be the way to handle these battles, something that has a hero emphasis like LotR, which happily has pretty much all of the elements needed already, including chariots and rules for mounting/dismounting, which could be applied to the chariots. As far as I know, there are two sources of miniatures for this period, Wargames Foundry, and Eureka. Both companies have various supporting lines of ancient civilians and allied states that could prove useful as well, particularly if you are more interested in the fantastic aspects of the battle than in the strictly historical.